Earlier this week Claudia and I backpacked for 5 days in the mountains west of Silverton, Colorado, following an improvised route that took us through numerous high alpine basins filled with endless fields of wildflowers. With a weather forecast calling for lots of rain, we almost decided against this trip – but then I considered that bad weather usually equals good photos, so at the last minute we decided to go for it anyways. Although we did have our fair share of rain, we also witnessed some of the most spectacular scenes of the summer so far! Sultan Mountain at the end of the rainbow. After dropping our truck off at a distant trailhead, I walked and hitchhiked six miles to our starting point near Sultan Mountain. We crossed the river, hiked up an unmarked trail, and arrived at our first camp just as the first raindrops started falling. 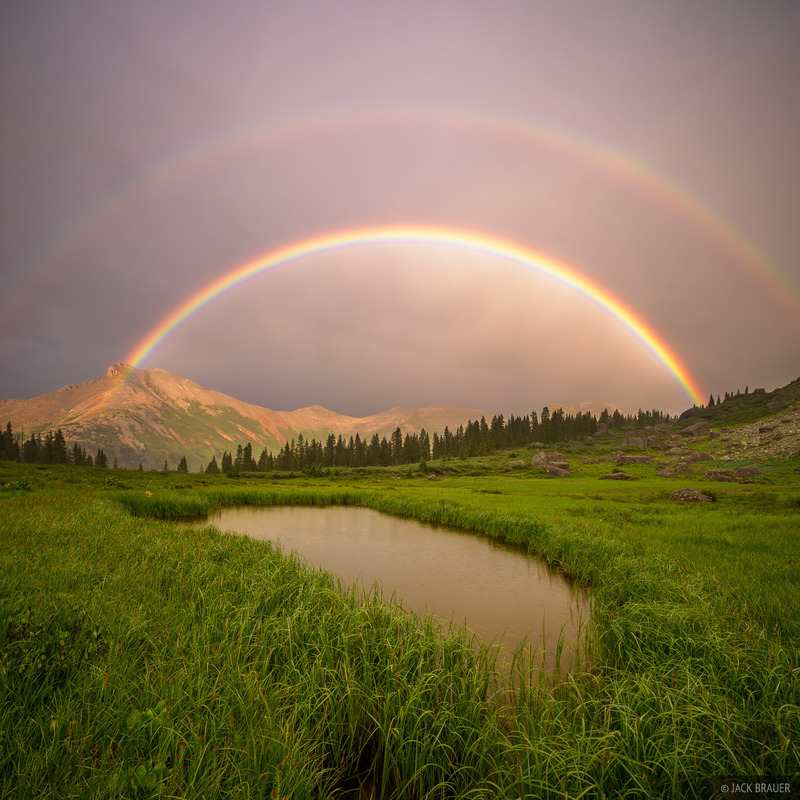 In the evening we were stoked to watch a brilliant double rainbow form overhead. 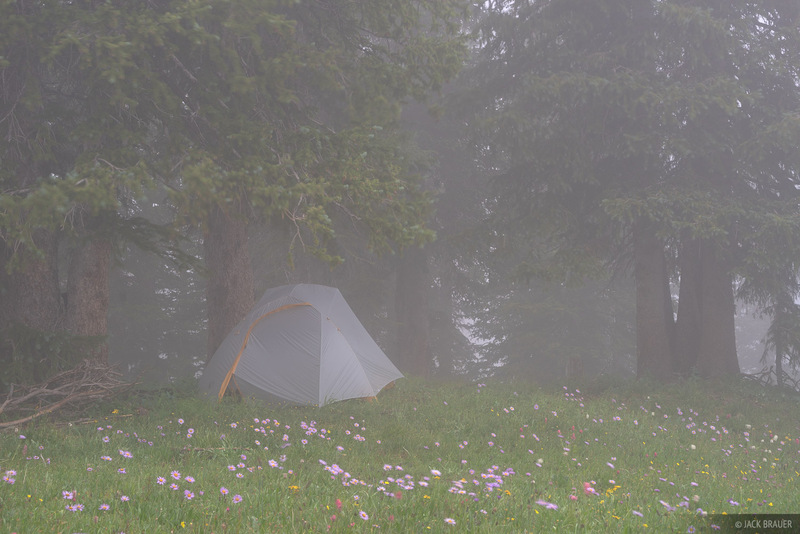 You bet I was glad we went backpacking after all! 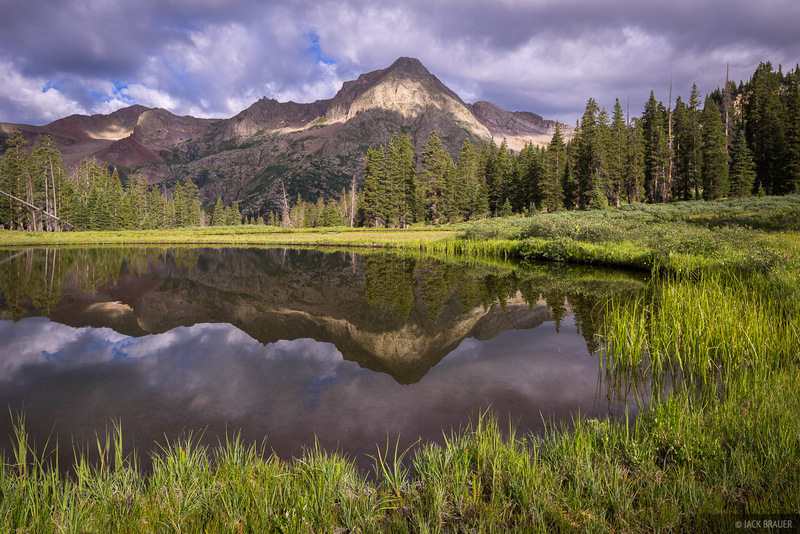 Grand Turk reflects in a small alpine pond. The second day involved a fairly grueling but highly scenic 12 mile hike joining the Colorado Trail for a while then crossing over a high pass towards Engineer Mountain – the latter half of the hike in pouring rain. A large field of Indian Paintbrush wildflowers on a stormy July morning. The wildflowers were the best I’ve ever seen, thick fields coloring the mountainsides in pastel shades from afar, and brilliant kaleidoscopes of colors up close. Pure eye candy everywhere! 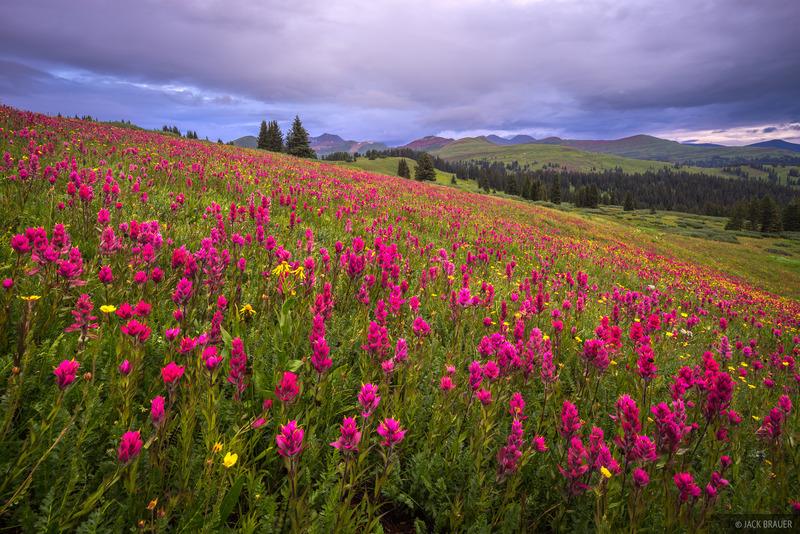 The profusion of wildflowers this summer is likely due to a healthy winter snowpack that lingered around until late June, as well as a fairly wet and not-super-hot June. Wildflowers like water! 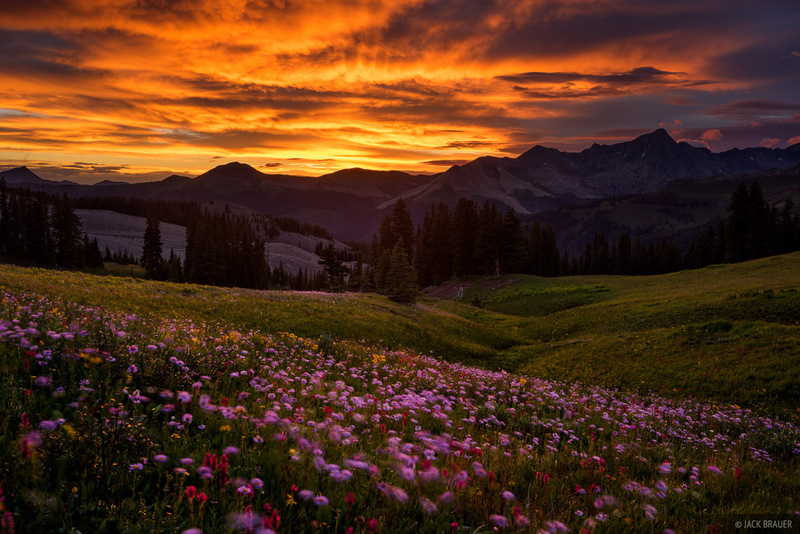 The sun rises upon a glorious field of Indian Paintbrush wildflowers - July. 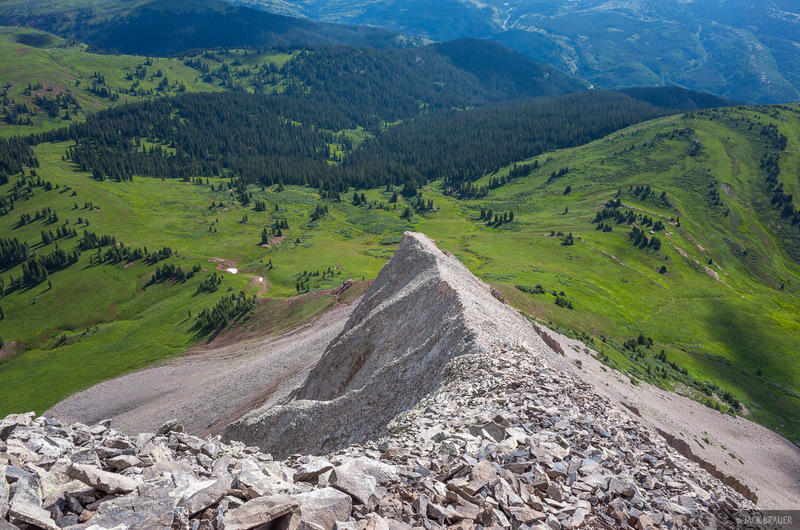 Looking down the shattered ridge of Engineer Mountain. A large rock glacier below Engineer Mountain. 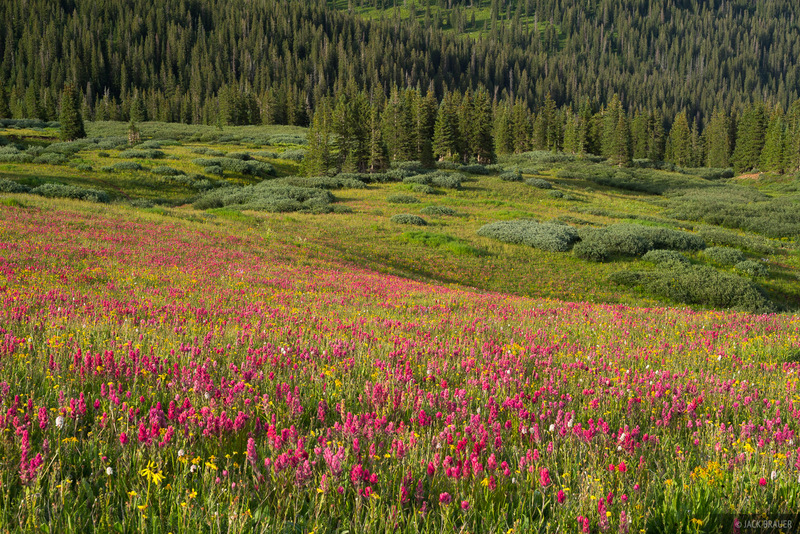 Vast field of Indian Paintbrush wildflowers. We spent two nights in this fantastic spot, and on the second night after a wet and stormy day spent mostly in the tent, we were treated to an insanely awesome sunset. A fiery sunset over Grizzly Peak - July. 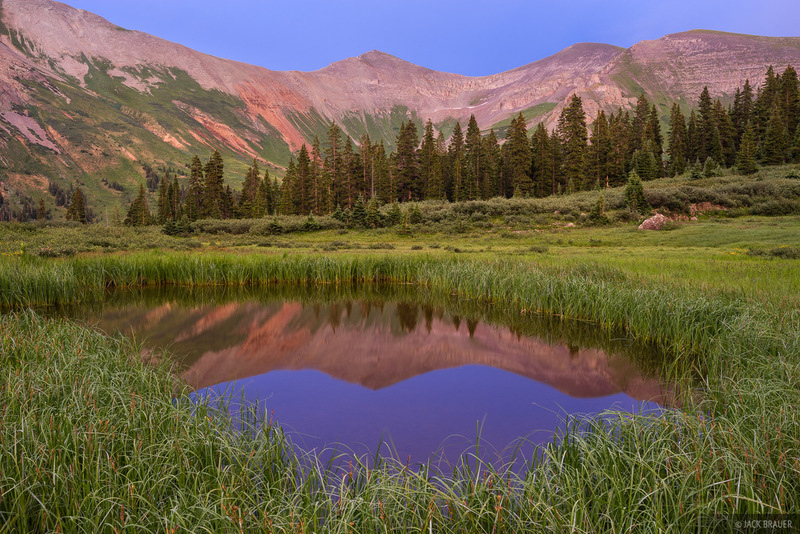 Grizzly Peak (13738 ft) on a calm July morning. Next we continued on towards Rolling Mountain for an evening with a view of the rugged and remote Grizzly Peak. 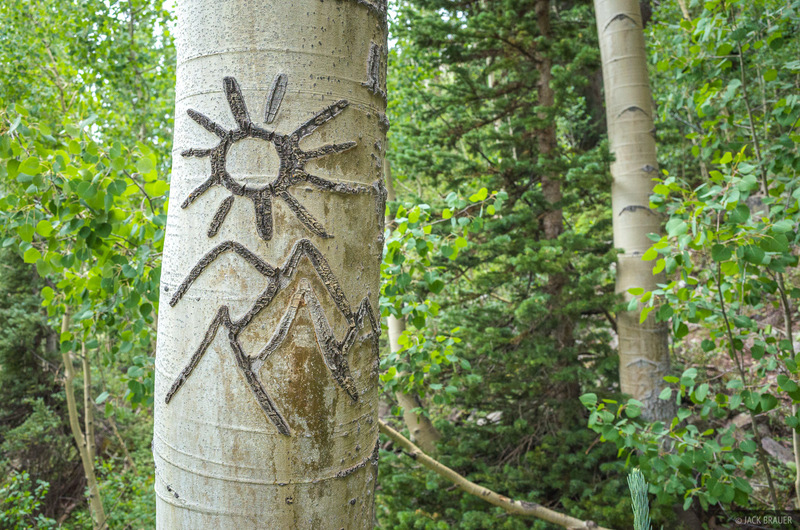 Artistic carving on an aspen tree. Though we didn’t see a whole lot of that Colorado sun on this trek, it couldn’t have been any more beautiful.